Technique: High-resolution Echelle spectroscopy, whereby the spectral range (360 - 900 nm) is folded into shorter segments and projected on a CCD camera for simultaneous exposure. Scientific objective: Spectral resolution of shock layer radiation. Resolve spectral lines of air plasma emissions at optical wavelengths for the measurement of excitation temperatures. Provide highest possible spectral resolution. Instrument: This instrument consists of a 100 mm f4.5 UV Nikkor lens and Catalina Scientific Corp. "Echellette" Spectrograph with Visible Module or UV Module coupled to a Q-Imaging "Intensified Retiga" blue-enhanced image intensified CCD camera. 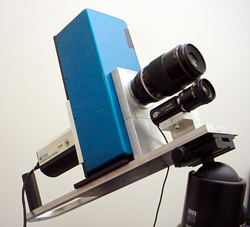 Heritage: The miniature Echelle spectrograph was deployed before in slit-mode with a rapid pointing device called "AIMIT", but is now setup in slit-less mode to permit manual pointing by means of a co-aligned widefield (30-40 degree) low-light level CCD camera and video headset display. Aircraft hardware requirements: Ballmount gimble at window. Electric power outlet at window. Stowbox. No rack. 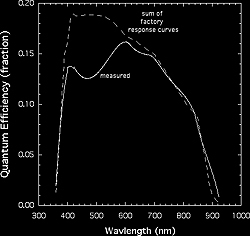 Instrument validation tests: Spectral response and resolution measured from calibration lamps. Sensitivity measured to natural point sources (Mars and Venus). Both were detected, Stardust SRC entry expected to be brighter. Motion blurring was tested and found neglegible for exposure time of 27 msec, noticeable but not problematic for 50 msec exposure time. Visible Module has about twice the order separation than the UV Module, permitting more motion blurring. Was successfully pointed to airplanes in the sky. Sensitivity: Obtains a signal-to-noise of (1 sigma) 7.9 at 777 nm in a 27 msec exposure on the planet Mars (V = -2.2 magnitude) in 2x2 binning using UV module. Signal-to-noise varies periodically along the spectrum due to blaze. Dynamic range: 12-bit (factor 4096). Frame rate and exposure times: 20-50 milli-seconds exposure time per frame. Up to 10 frames/s (1x1 binning) for 10 seconds of data or up to 40 frames/s (2x2 binning) for 40 seconds maximum memory capacity. 0.3 nm on average - slightly larger towards red, smaller towards blue. Measured on nearby calibration lamp "point" source (resolved, so upper limit only). Visible Module (factory value: 0.46 nm): 0.44 nm at 866 nm, 0.44 nm at 579 nm, 0.34 nm at 404 nm, 0.35 nm at 366 nm, 0.20 nm at 297 nm. UV Module factory value: 0.14 nm, but periodic gaps in spectrum above 600 nm where orders are wider than the photocathode of the intensified camera.